You know that stuff that ends up tucked randomly into any corner of the house? Crafts supplies? Magazines? Teenagers' shoes? Well, you've just found the spot where they belong! These funky canvas bins are as flexible as your storage needs. 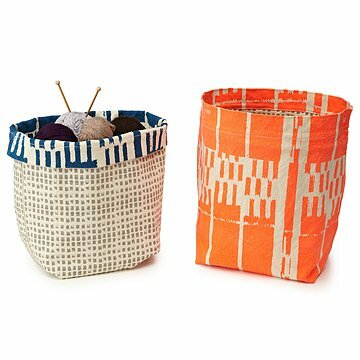 Each reversible bin has a soothing gray pattern on one side of its fabric, and bold splashes of color on the other. The soft sides flex to accommodate awkwardly shaped items, and the top can be folded down like a cuff, making the bin just the right height to fit available spaces. Two plastic rods can be inserted into special slots in the material to help reinforce their shape. Canvas material is 100% organic cotton, and machine washable. Made with responsible business practices in China. 15" H x 14.5" Dia. Care instructions:machine wash warm water, lay flat to dry. Canvas Storage Bins - Blue and Orange have been discontinued. When they sell out, they will no longer be available. These organic cotton bins are perfect to hold various stuff; they help me tidy up my bedroom while adding some style with the color and design. These colorful, fabric cubes are designed to suit flexible storage needs.